The word is out that the recent Las Vegas shooting was a false flag attack created to achieve some agenda. There are many points of evidence that suggest this to be true, and we will get to that evidence in a moment, but first, let's consider a few things. In the past, false flags seemed to be well-planned and were executed without much of anyone noticing what was happening. Unless an individual was in the military, worked in intelligence and witnessed such events firsthand, there was very little opportunity for a person to determine the true nature of potential false flag attacks. Up until a number of years ago, handheld digital photography and videography did not exist. These were technologies that were too expensive and too bulky for the average person to carry around on a constant basis. However, today, virtually everyone has a smartphone or cell phone that allows them to document anything they want—making it instantly available for viewers online. Naturally when the media botches honest and accurate reporting, there are typically tens of people on sight recording and reporting events as they take place. This is what we have seen on the subject of the Law Vegas shooting. The overall haphazardness of this apparent false flag seems to reveal that something has most definitely changed among the nefarious powers that soon won't be. The media has failed to convince the people of the official story and those behind this attack failed to orchestrate anything resembling a believable situation. If these financial interests—who have come to be known as the Cabal—were truly behind this shooting in Las Vegas, this would mean that these criminal elitists have lost their ability to successfully deceive the people. It means that the only weapons these criminals have left is an old and failed plan of mass murder under the cover of media distortion. It seems that this false flag is just another empty attempt to disarm the public—a public that has become excessively tired of being robbed, manipulated and murdered by wealthy crooks. To add, it seems that these elitists are so afraid of their impending overthrow, that they are now unwittingly working tirelessly to guarantee that overthrow. Acts of mass murder such as the Vegas shooting—along with the commonplace blitz of media lies that typically followed—seem to be the trademark of the old and dying order of criminal elitism in our world. The fact is that the people are awake and are far too observant to allow cheap tricks to manipulate our minds any longer. One positive aspect of criminal elitists is that they are largely predictable. They are commonly addicted to wealth and power and when these are threatened, elitists will do almost anything to regain them. The fact is that the more excessive the efforts of these criminals become, the easier they are to see for the average person. In this way, the Cabal has largely dug their own grave in their frantic attempt to maintain control. I do not condone violence upon these people (no matter how twisted their actions and ideology might be), but would rather see them face judgement in an open and transparent court system. However, I do believe that the more mass death these criminals orchestrate the more difficult it will be to hold back the throngs of people who do not share my sentiment. It seems the Cabal holds their own lives in their hands, and as things appear, they are fumbling. (Natural News) It’s all hogwash. The “official” narrative of how things went down in the Las Vegas massacre is so full of holes that it begs the question of just how deep the truth about this attack really goes. What we know for sure is that, yes, 59 people were killed (so far) and hundreds were wounded. This wasn’t a “hoax” shooting — people actually were shot, wounded and killed (and our prayers go out to all their families for this horrific tragedy). Yet the official narrative that claims Stephen Paddock — a retired, 64-year-old accountant with absolutely no firearms training, no gun experience and no physical stamina — was somehow able to expertly wield a highly complex (and physically demanding) weapon system for 10 sustained minutes is total nonsense. Even highly trained Navy Seals would have a difficult time running a full auto weapon for 10 minutes straight. Such weapon systems are brutal on the operator. They require tremendous strength, stamina and expert troubleshooting to keep running. Full-auto weapons overheat and jam. They demand incredible strength to keep aimed on target. They require expert reloading and weapons clearing in the case of jams, and the hotel room would have been so full of smoke and powder residue that it would be almost impossible to keep breathing from that enclosed space. Here are 10+ reasons why the official narrative is complete B.S. #1: As many as 10 rifles were found in his hotel room… but only one shooter? Why would a single shooter need 10 rifles? Managing just one full auto weapon system is so difficult that it’s probably beyond the physical capabilities of a 64-year-old retired accountant, which is what Paddock was. The rifles were staged for more than one shooter. The operation was extremely well funded. The attack took a tremendous amount of time to set up, because you don’t just walk 10 rifles up to your hotel room in a single trip. According to numerous media reports, Paddock was found dead in his hotel room, shot to death. The official narrative claims that he shot himself before the police breached the room, but that is an assumption, not an established fact. There is no evidence whatsoever that Paddock shot himself. It is simply assumed that he did so. I would ask to see the ballistics evidence of the shot that killed him. Isn’t it all convenient? There’s no one left to question, and they don’t even have to drug the guy into oblivion like they did the Aurora, Colorado shooter named James Holmes. Eliminating the scapegoat is the oldest trick in the book, as we were all reminded with the shooting of JFK. #3: Why are there no muzzle flashes visible from the 32nd-floor Mandalay Bay windows in any of the videos that captured the shooting? If you look at the shooting videos that have been posted online, none of them show any muzzle flashes from the room on the 32nd floor that we’ve been told is the source of the shooting. How can that be? 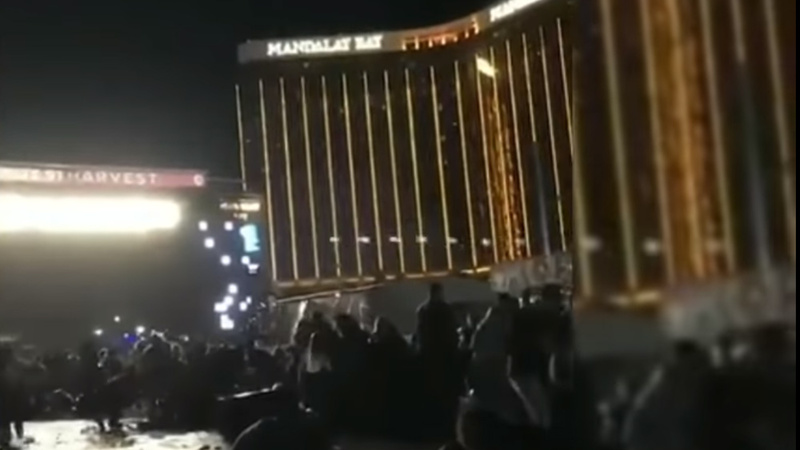 The following video captures the sound of the automatic weapons fire — and even appears to capture at least TWO weapons firing simultaneously — yet shows no muzzle flashes from the 32nd floor windows of the Mandalay Bay hotel. #4 Why does the gunfire in multiple online videos clearly sound like automatic weapons fire from MULTIPLE weapons? I challenge anyone to listen to the gunfire in these online videos and conclude it’s only from a single weapon. The very idea is totally absurd. You can clearly hear at least two automatic weapons systems firing over each other. Islamic State has claimed responsibility for a shooting that killed at least 50 people and wounded over 400 in Las Vegas early on Monday, and said the attacker had converted to Islam a few months ago. ISIS has a long track record of only claiming responsibility for events they inspired or planned. It would not be in the interests of ISIS to falsely claim credit for an attack they did not help carry out, as that would discredit their own supporters and funding sources. Saying his family was in shock, Paddock’s brother told US media he could not understand what motivated his elder brother. “Where the hell did he get automatic weapons? He has no military background or anything like that,” Eric Paddock told CBS News. Eric said his brother was typically no fan of such weaponry. “Not an avid gun guy at all,” Eric Paddock told CBS News outside his home in Waterford Lakes, Fla.
#7: How does a 64-year-old accountant with no military training possess the strength and stamina to fire a fully automatic weapon for nearly 10 minutes? People who aren’t familiar with firearms have no idea how difficult it is to conduct sustained fire with an automatic weapon. It requires tremendous strength, endurance and training — something that Stephen Paddock had none of. Military special forces operatives train for years to be able to manage such weapons and handle all the problems they pose (barrel overheating, ammo jams, double feeds, recoil management, etc.). The idea that some senior citizen accountant can just pick up a machine gun and lay down thousands of rounds of effective fire in a sustained, 10-minute assault even though he had no experience with such weapons is completely ludicrous. It actually looks like someone else staged all the guns in the room, perhaps with Paddock’s willingness, then shot and killed Paddock to make him the scapegoat. Despite being found amid an arsenal of weapons, Eric said that his brother had never been ‘an avid gun guy at all’, adding that he was at a loss as to where Stephen got his arsenal of automatic weapons from. #8: Stephen Paddock was gambling away huge amounts of cash… where did he get all that money? On several occasions, Stephen Paddock gambled more than $10,000 per day — and in some cases more than than $20,000 and $30,000 a day — at Las Vegas casinos, according to an NBC News source who read the suspect’s Multiple Currency Transaction Reports (CTR) and a casino gaming executive. Was he paid to be part of an operation that would then be blamed on him by making him the scapegoat? Some media reports state that Paddock was a wealthy real estate investor. If that’s true, why would he blow all that wealth on gambling? Interesting that you brought up the financial connection. I had thought of this as well...where the fu*z did he get all of that money?